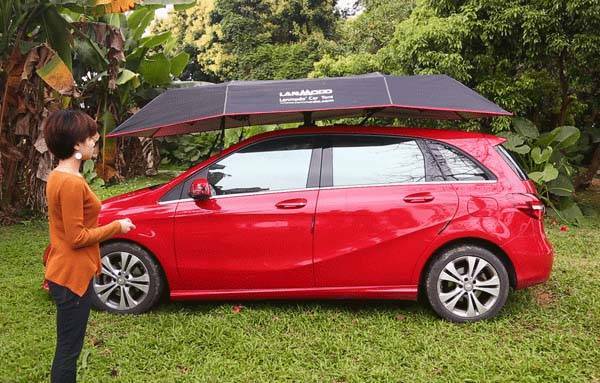 In addition to preventing your car from high temperatures in how weather, Lanmodo all-in-one automatic car tent also delivers more than 20 features such as acting as a camping tent, beach umbrella and more. Sounds cool? Let’s keep checking. The Lanmodo is a multi functional and easy-to-set automatic car tent that measures 3.5m long by 2.1m wide. When packaged in its custom carrying bag, it only measures 87cm long and weighs 6.5kg for easy to carry. The car tent is designed to fit for various cars such as Sedan, SUV, Jeep, Pickup, Mini, 4-wheel beach vehicles and more. Using a strong sucker, the car tent can be fixed on the top of your car, and four wind ropes can be attached to your car door handles and front view mirrors for better stability. The car tent structure is made of fiberglass so it’s strong enough to withstand windy weather with a maximum wind speed of 13m/s, falling objects and hail. Meanwhile, its cloth is made of 210D Oxford for waterproof design and easy to clean. Using an included remote, you can effortlessly open the tent in order to cool down your car interior temperature up to 35 degrees. Furthermore, using an optional adjustable stand, the car tent acts as a camping tent that fits for four travelers, or you can also use it as a sunshade to bring you a happy time on the beach. The Lanmodo’s rechargeable battery can be on standby for 45 days with power, and an extra USB port can be used to charge your mobile devices or power an LED light for a great outdoor party. The Lanmodo has been available for preorder via Indiegogo in form of crowdfunding campaign. 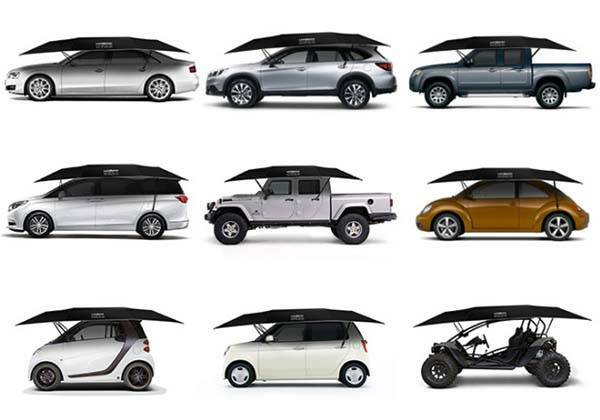 You can pledge $279 to preorder the car tent and an adjustable stand. The set would be shipped in July 2017 (estimated).